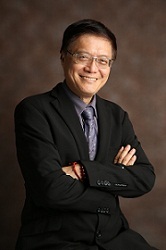 Prof Tay Beng Kang is a pioneer in Filtered Catholic Vacuum Arc (FCVA) technology and works for many years in developing thin film materials especially in amorphous carbon, nanocomposites, graphene and carbon nanotubes. His current research includes growth and application of 2D TMDC materials and their heterostructures, fabrication and characterization of nanostructures for field emission, thermal and high frequency RF applications. To date, Prof Tay has published more than 400 journal papers with Google Scholar H index of 60. Prof Tay is also the co-inventor of 25 international patents for 7 technologies filed between 1995 and 1998. Nanofilm Technologies Pte Ltd was established in 1999 as a spin-off licensing exclusively IP developed at NTU on Filtered Cathodic Vacuum Arc technologies. The research team was subsequently awarded the ASEAN Outstanding Engineering Award and National Technology Award in 1997 and 2000 respectively for outstanding R&D contributions on a new Filtered Cathodic Vacuum Arc Technology. Prof Tay’s research has been recognized internationally where he works closely with companies such as Excelitas Technologies, IIA Technologies, Thales Group where he also supervised several EDB Industry Postgraduate Programme (IPP) students. He is currently the Deputy Director of CINTRA, a UMI research unit cofounded by CNRS, NTU and Thales. He has been an invited speaker at numerous international conferences and universities. 2015	Prof Tay Beng Kang The Long Service Medal from Singapore National Day Awards (MOE) To recognize who have rendered outstanding service. 2007	IES Prestigious Engineering Awards (by The Institution of Engineers Singapore) In recognition of an outstanding project, Nano-Engineered Carbon Hybrid Systems, which has made significant contributions to Singapore's development. 2003	NTU Alumni Service Award	To recognize alumni who have rendered outstanding service and contributed significantly in furthering the interests of the University and its alumni. The high quality of the films produced by FCVA attracted many foreign visitors and potential customers from abroad. Nanofilm Technologies International Pte Ltd (Nanofilm) was finally set up in May 1999 with NTU Ventures to design, develop and commercialize FCVA related vacuum coating systems. Nanofilm is doing well, not only selling machine and systems, but also the coating service. It received the prestigious National i-Award (Innovation) in 2001. Website ©2011, Tay Beng Kang. All rights reserved. Publications' copyright belong to respective publishers. and in accordance with the copyright laws that may apply.